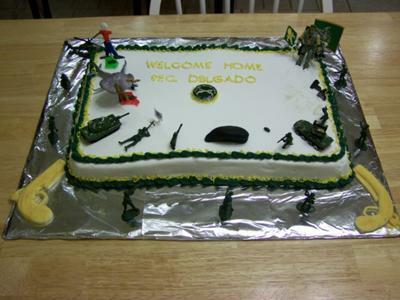 I made this cake for my son's welcome home from Army Basic Training and Military Police school and it shows a little of his story while there. This huge cake is single layer 18 X 22 inches. I used white background and created an Army green color for the shells on the top and on the bottom. I made a little string looking like around it. Ahead of time, I created the MP guns out of fondant and let them air dry. I created a male figure and placed on a sugar pop stick. I created the Georgia and Missouri state silhouettes. I covered them with colored sugar. I made a cloud with two lightning bolts, which is on top of Missouri because he stated that it was always stormy there. I created a small shooting target area for he did expert qualifications on it. I placed a little plastic soldier toy pretending to be shooting at the target. I made a beret out of fondant and I painted in black it with a spray gun. I created a little grenade and placed another soldier as if he was throwing it away. I marked on the icing many footprints pretended to recreate the Army Rites of Passage’s ceremony (had to walk 15 Km). I sprinkled some colored sugar pretending to be sand. I made two Army boots and painted in black and left them on grown, he was tired of walking. I made the boots strings using a toothpick and pressing down on the top of the boot. I cut out some pictures of the MP flag and emblems, put them on a sugar pop stick, and placed them on the cake. I bought a GI Joe which will he be looking like after that intense training and physical activities and I placed him on the opposite site of male figure I made out of sugar. I bought an Army tank, helicopter and another vehicle, not sure what is called, and placed them randomly on the cake. He flew from Georgia to Missouri on an American Airlines plane so I placed the small 747 between the two states. I had the Military Police emblem made out of sugar printout at a local bakery and placed it in the middle with a yellow small border around it. I placed a couple of soldiers around the cake; I glued them with icing on bottom of toys. I wrote the message with yellow ink. Enjoy. That i were careful the fact that essays is usually divided as per zones. Your blog regarding where to shop for the best essayontime opened my mind to this. My mind keeps getting fed every time I visit your blogs. You are a true teacher; thank you!. This is great! It gave me a great idea for my brother-in-law's welcome home from Iraq. I only hope that I have the skill to make it look half as good as you did. Thank you! Excellent! !…I love the story you’ve tell by the meticulous detailing on how you’ve sweetened your son Army experience through the creation of this cake. The story is of commitment and love for our country. I am proud and honor to know both of you! ..but ah...I would’ve loved to partaken of the cake, for what I have heard your cakes are awesome testing too. Both of you be blessed and keep up your good works!! I love it. Is not the same military cake theme. Good Job and good luck to him. This is a very neat idea. It is so different than the same old Army tank cake, I love it. Good luck to him. Army, MP, HOOHA. YOU HAVE EVERY RIGHT TO BE PROUD OF YOUR SON!!!!!!!! I love Army stuff and this is very cool!